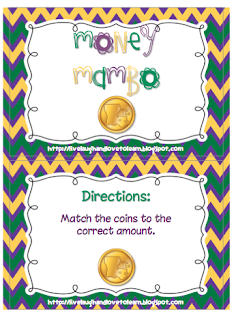 Here's a little money matching game with a Mardi Gras theme! I hope you and your kiddos enjoy!!! I am a second grade math, spelling, social studies, and science teacher! I earned National Board certification in 2008, and finished my Master's degree in May! I am married and have one daughter (17) who keeps me super busy!